Carpets can make or break the look for a room. It is normally a priority for the majority of homeowners to have carpet in their homes to make it look as nice and elegant as possible. Carpets usually look their best when they are still new and clean. Carpet attracts dust and dirt along with other allergens that can get all tracked in from being outdoors. Other allergens that can get trapped in your carpet are dust mite infestations and mold growth. Also depending on the color of the carpet, stains can be easier to see over time and will begin to pop out making the carpet look dirty. Once the carpet gets to this point, it destroys your whole look or atmosphere associated with the room. Whether done on your own or you call us All Star Carpet Cleaning, you need to make sure that your carpets look as new as they should in order to help the feel and look of the inside of your home. There are three stages to cleaning a carpet. Carpeting is of course very delicate and has to be cleaned properly in order to maintain the life and health of your carpet. • The carpet is sprinkled or sprayed with a pretreatment solution that releases the soils and dirt along side dust and solid particles from your carpet. This enables them to come to surface to be cleaned. • There are 3 commons methods and various methods work with different places. • This simply leaves the carpet smelling and looking like new and can protect the life span of the carpet. Remember, a clean carpet will always make a room look attractive. 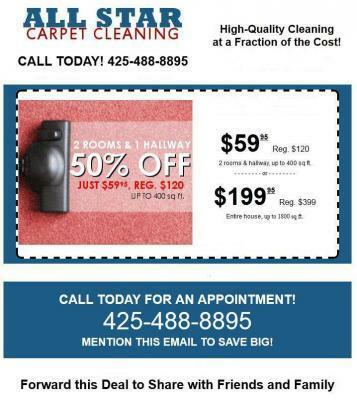 Let us take care of you Woodinville, WA Carpet Cleaning needs. Call us today at (425) 488-8895.